Why are we in South Vietnam? We are there because we have a promise to keep. Since 1954 every American President has offered support to the people of South Vietnam. We have helped to build, and we have helped to defend. Thus, over many years, we have made a national pledge to help South Vietnam defend its independence. And I intend to keep that promise. Technically, LBJ was right. American support for South Vietnam, officially the Republic of Vietnam, dated from 1954; prior to that there was no “South Vietnam.” But U.S. involvement actually went much deeper, dating back to when the territory was still French Indochina. Why had we made a "national pledge" to defend a small country few Americans could find on a map? No one born much after 1945 can remember the “us or them” intensity of the Cold War, the long ideological battle against what, many years later, Ronald Regan would call the Evil Empire of Soviet style communism. Communism had to be stopped, and only the United States, the leader of the "Free World", had the means to do it. Viewed from a twenty-first century vantage point, the mindset seems almost paranoid. But to those who oversaw the waging of it, the Cold War was deadly serious business. At stake, or so they proclaimed, was nothing less than the American way of life. Understanding the roots of the Vietnam War requires a look back to the close of the Second World War. At the Yalta Conference in February, 1945, the USSR had agreed to enter the war against Japan once Germany had been defeated. Stalin kept his word, and in August the Red Army quickly crushed Japanese forces in Manchuria. In China proper, expulsion of the defeated Japanese merely cleared the way for resumption of the civil war between Chiang Kai-Shek’s Nationalists and communist armies under Mao Tse-Tung, which now had large Soviet forces at their backs. In Korea, the victorious allies agreed that Russian forces would take the Japanese surrender north of the 38th parallel. South of the line, U.S. forces would handle the disarmament. The arrangement was meant to be temporary, lasting only until the country could be reunited under the auspices of the newly created United Nations. But when it became obvious that communist intransience would not allow unification, two separate and bitterly antagonistic Korean states were formed; a situation that remains virtually unchanged nearly seventy years later. Elsewhere, the stunning Japanese conquests in early 1942 had swept aside colonial governments from Burma eastward to New Guinea and from Hong Kong south to Singapore and Java. The Japanese could scarcely be called liberators, but at war’s end the native peoples were not disposed to again shoulder the yokes of their recently deposed European masters. In Indochina, resistance to French rule was by no means new, but in one fell stroke the Japanese had done for the Vietnamese what they themselves had not the power to accomplish. On 2 September 1945, the date of Japan’s formal surrender, Ho Chi Minh proclaimed the Democratic Republic of Vietnam. Ho’s "government" was short-lived. France, despite giving lip service to independence for the Indochinese states within the French Union, clearly had no intention of giving up the vestiges of empire. It took time, but once French forces could be transported back to Indochina all pretense of negotiations disappeared. By 1947, Vietnam was in a virtual state of war. Ho and his chief military commander, Vo Nguyen Giap, again fled to the forests. In China, meanwhile, Chiang Kai-Shek’s weak and corrupt Nationalist regime, despite the infusion of some $2 billion in U.S. aid, was rapidly collapsing. On 10 December 1949, Mao Tse-Tung proclaimed the Peoples Republic of China. Chiang, with the remnants of his army, fled to Taiwan. Mao’s victory opened up an ever-expanding arms pipeline to Ho's Viet Minh insurgents, and provided a cross-border sanctuary within which whole divisions of Vo Nguyen Giap’s Vietnam People’s Army (PAVN) could be trained and equipped without fear of French interference. There was more. On 14 January 1950, the USSR formally recognized the Democratic Republic of Vietnam. With acceptance of a communist Vietnam out of the question, the U.S. faced an unpleasant choice—support true self-determination for the Indochinese people or keep France, colonies and all, as the linchpin of NATO, the European defense alliance. In the frigid atmosphere of the Cold War, there was no realistic option. What was in truth a colonial war was now rebranded as an anti-communist crusade. It was a war that France had neither the capability nor the will to win, but which now the United States could not allow to be lost. As Vietnam heated to a slow boil, Korea suddenly exploded. On 25 June 1950, in a move rivaling in surprise the attack on Pearl Harbor nine years before, North Korean armies swept across the 38th parallel. The U.S. was under no formal obligation to defend South Korea, but failure to do so in the face of a blatant communist invasion would represent an intolerable blow to American prestige throughout the world. With the Soviet delegate absent, an emergency session of the UN Security Council passed a resolution condemning the invasion and calling for support of South Korea. A few days later President Truman, with the full concurrence of the Joint Chiefs of Staff, committed U.S. ground troops as part of an American led UN command under General Douglas MacArthur. The initial communist onslaught nearly pushed UN forces off the peninsula, but only six weeks later the daring amphibious landing at Inchon sparked a spectacular counterattack which overran the North Korean capital of Pyongyang and pushed the enemy past the 38th parallel all the way to the Yalu River, the border with Red China. There was a risk, clearly understood, that either the USSR or China might intervene to prevent the elimination of a neighboring communist state. In late November, some 300,000 troops of the Chinese People’s Liberation Army (PLA) suddenly debouched from the hills of North Korea. That a force of such magnitude could somehow go undetected would go down as one of the great intelligence failures of the Cold War era. The Chinese Communist counterattack triggered some of the bitterest fighting in U.S. military history, exemplified by the epic fighting withdrawal from the Chosin reservoir. But as Chinese momentum slowed, American led forces stabilized the front and began their own renewed offensive. By the summer of 1951, the war had ground to a bloody stalemate. Short of all out war, with the risk of a nuclear clash in which there could be no real winner, a World War II style victory in Korea was out of the question. The limited U.S. objective would instead be to secure the best possible defensive line somewhere around the 38th parallel while seeking a negotiated end to the conflict. In early July, 1951, after prodding from the Soviets, the Chinese and North Koreans agreed to begin peace talks. During two more years of “fighting while talking”, images of human wave attacks at places with nicknames like Heartbreak Ridge and Pork Chop Hill were burned deeply into the institutional consciousness of the American military establishment. Another land war in Asia was to be avoided at all costs. As the peace Conference convened in Geneva, the long Indochinese conflict headed toward a climax deep in the western Tonkin wilderness. 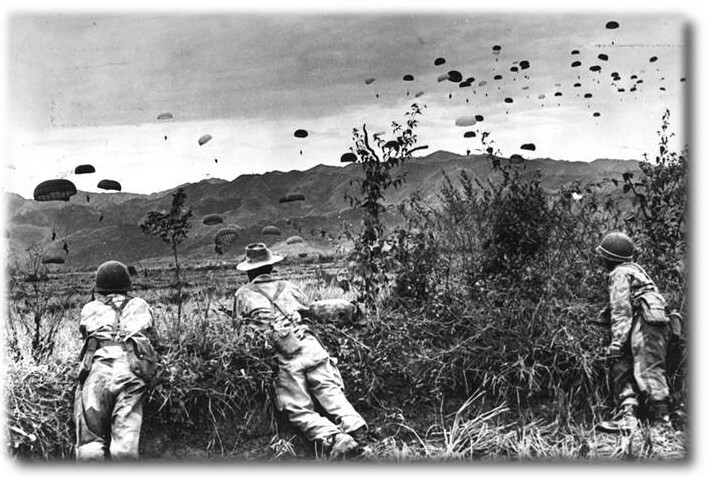 In November, 1952, French-led paratroopers dropped into the valley of Dien Bien Phu in order to build a “hedgehog” base astride a possible Viet Minh invasion route into neighboring Laos. The aero-ground base at Dien Bien Phu would also support indigenous anti-communist partisans and protect their rice and opium crops. Any enemy force massing to attack the stronghold would be pulverized by air strikes and artillery—or so the French high command reasoned. Dien Bien Phu would go down as one of the epic battles in modern military history. Simply put, the Vietnamese (with considerable Chinese help) pulled off a feat of logistics no Western observer considered possible. Four Viet Minh divisions surrounded Dien Bien Phu, then proceeded to haul captured U.S. howitzers and thousands of tons of ammunition up the mountains overlooking the valley. Meanwhile, plenipotentiaries of the interested parties—including Communist China—gathered at Geneva. Under orders from Washington, the U.S. delegation, attending as observers only, refused to even acknowledge the Chinese presence. The State of Vietnam, nominally a member of the French Union, not only had little voice in the proceedings but was bound to accept whatever decisions France might make. At Dien Bien Phu, airlift kept the beleaguered stronghold supplied for a time. But as Viet Minh trenches inched ever closer, artillery barrages, unchecked by ineffective French counter-battery work, forced the defenders to ground and eventually closed the airstrip. When concentrated anti-aircraft fire made even accurate parachute drops impossible, the outpost was doomed. After fifty-seven days of shelling interspersed with desperate hand-to-hand combat, the battered Dien Bien Phu survivors surrendered on 7 May. Psychologically and financially, the French were spent; no amount of American threats or cajoling would convince them to carry on once an honorable exit could be found. The game was over, formalized by an Agreement on the Cessation of Hostilities in Vietnam, issued from Geneva on 20 June 1954. Militarily, the Geneva agreements established a provisional demarcation line in the vicinity of 17 degrees north latitude, behind which the respective forces would move into designated assembly areas. To avoid incidents, a demilitarized buffer zone not to exceed 5 km in width would be established on either side of the demarcation line. Once regrouped, NVA troops would withdraw north of the line while French Union forces withdrew to the south. The Final Declaration on Indochina, issued the day after the ceasefire agreement, called for general elections to be held in July 1956 so that Vietnamese people might “enjoy the fundamental freedoms, guaranteed by democratic institutions established as a result of free general elections by secret ballot.” During the 300-day grace period, any civilians “residing in a district controlled by one party who wish to go and live in the zone assigned to the other party” were to be allowed to do so. By one means or another, almost 900,000 Vietnamese came south in 1954-55. To the hardline Cold Warriors in the Eisenhower administration, the Geneva Accords represented nothing short of a disaster. The State of “Free Vietnam”, which had essentially been shut out of the proceedings anyway, refused to sign the agreements (and therefore could claim not to be bound by them.) The North Vietnamese also had reason to feel slighted; in spite of their clear cut military victory, they’d been left with only half the loaf. But the communists knew time was on their side. The CIA noted ominously that “If the scheduled national elections are held…the Viet Minh will almost certainly win.” The elections, of course, never took place. In the midst of the Geneva negotiations, Bao Dai, the French-anointed emperor of Vietnam, suddenly named as his premier Ngo Dinh Diem, one-time Interior Minister in the Imperial court who had left politics and gone into self-imposed exile years before. Diem was a zealous nationalist, a rather ascetic practicing Catholic, and fiercely anticommunist and anti-French in about equal measure. He promptly sacked Bai Dai, had himself elected president of the Republic of Vietnam, and renounced the Geneva agreements. Diem had little grassroots support, but to the powers in Washington he represented the best, perhaps the only, chance of preserving a noncommunist government in South Vietnam. With the departure of the last French troops in 1955-56, the U.S. now assumed responsibility for training and equipping a South Vietnamese army and, implicitly, for guaranteeing South Vietnam’s very survival. The "national pledge" to which Lyndon Johnson would refer a decade later had been made, although few Americans were aware of it. To the surprise of most observers (and with some help from the CIA), Diem managed to strengthen his hold on South Vietnam. Internal dissidents were defeated or coopted, and a communist "denunciation" program caused the stay behind Viet Minh cadre considerable grief. Despite sporadic incidents of terrorism, South Vietnam enjoyed a period of relative peace during 1955-56. But the southern communists—labelled "Viet Cong" by Diem's propaganda machine—were suffering, and their plight was obviously known to the politburo in Hanoi. The turning point of the insurgency came in January, 1959. The 15th Plenary Session of the Vietnamese communist party Central Committee decreed in a secret resolution that South Vietnam would be liberated through “revolutionary violence.” To preserve the illusion of an independent insurrection in the south, the National Liberation Front (NLF) was established as the political arm of the Viet Cong. The NLF was a front in the truest sense of the word; although not yet clearly understood in Saigon or Washington, Hanoi had taken over the fight. In November, 1960, John F. Kennedy defeated Richard Nixon in one of the closest presidential elections in U.S. history. JFK’s inaugural address the following January was stirring; “Let every nation know, whether it wishes us well or ill, that we shall pay any price, bear any burden, meet any hardship, support any friend, oppose any foe to assure the survival and the success of liberty.” Thanks to Vietnam, the price would be higher, the burden heavier, and the hardships far more long lasting than anyone that day could have dreamed possible.